Many piano players would like to learn piano chords fast enough so that they can start playing in a band or doing their own solo performances. Sometimes the information required for them to learn to be a great piano player may seem to be a lot and may not work out because of limited time. 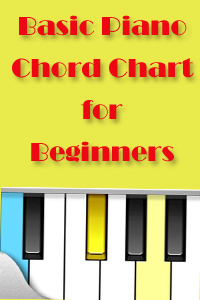 On this page you will be learning how to use specific formulas to construct piano chords. The construction is done based on some formulas that have been developed and used for centuries. I personally do not like the idea of starting out with chords as musician because this short cut method will cause you to be limited in theory. However, a number of musicians have been stimulated to learn music just by learning to use chords to play songs. The formulas displayed on this page are easy to understand and use, and they apply to all keys on the keyboard. The chords outlined on this page are divided into three categories; basic triads, 7th chords and ninth chords. Take a look at the formula used to construct each chord below. Each chord is constructed using the major scale as the base. Dominant 7th chord - 1st, 3rd, 5th, flat 7th. These are not all the chords that exist in music. However, players at the beginner and intermediate level will find them to be useful. When you are able to apply the formula provided in all twelve keys, you can focus on learning more advance chords. Leave learn piano chords page and return to home page.